4.0 out of 5 stars"I've got what I want. I've got Kansas." An uncharacteristic drama in a career dominated by comedies like The Court Jester and A Touch of Class, Melvin Frank's The Jayhawkers! is an ambitious Western drama with some interesting psychological undercurrents as Fess Parker's escaped convict is promised his freedom if he can deliver Jeff Chandler's ruthless empire builder for execution. Rather than the customary cattle king or ruthless outlaw, Chandler's got bigger plans, forming a private army of Jayhawkers to seize control of Kansas and turn it into his personal kingdom. Masquerading as brutal redlegs brutally pillaging small towns and then `liberating' them under their own colours, he's a keen student of history as well as a callous womaniser who uses women like wine - when the bottle is empty, he just throws the bottle away, with one difference "With a wine you sometimes learn the name, with women never." And wouldn't you know it, one of the women he threw away and left to die in the gutter was Parker's wife. But Parker falls under the spell of his big ideas and powerful personality, and it's not a one-way attraction. Chandler clearly has a more than fraternal interest in his latest recruit, casting aside former favourite Henry Silva and even killing his own men when they threaten Parker because "Nobody cheats me out of you!" Chandler dominates the film as the would-be dictator with a fear of being hung to dance on the end of a rope "like a clown" and something of a Napoleon complex (he even keeps a bust of the man in his home and gets Parker to read up on his campaigns) but who, as Nicole Maurey's French widow points out in the odd less than subtle nod to 20th century history, is just fooling the gullible to further his own ends. Often a better actor than his material, he has particularly strong material here and rises to the challenge admirably, leaving Parker's solid turn in the lead distinctly one dimensional by comparison. Silva, often either enjoyably over the top or disinterestedly walking through parts in many of his films is particularly impressive here as his homicidal spurned puppy as well. Sadly the film's climax is a bit underwhelming as the two protagonists go mano a mano in an abandoned bar while the sounds of offscreen battle rage around them before the film regains its footing, and at times the budgetary limitations show (some of the exterior locations are very noticeably studio interiors or backlots), but all told it works more than well enough to forgive the shortcomings. It's also helped along by a terrific Jerome Moross score that's got more than a hint of his previous year's The Big Country to it, while you can spot an unbilled Harry Dean Stanton as a lawman in an early scene. Olive Films' region-free Blu-ray disc is for the most part an impressive widescreen transfer that is more than sharp enough to show why the VistaVision system the film was shot in used to herald itself as `Motion Picture High-Fidelity,' though also clear enough to see a few scratches and slight tramlines on the negative around a couple of reel changes, some of the latter, because the film ran through the camera sideways, horizontal rather than vertical. No extras. 5.0 out of 5 starsTHE JAYHAWKERS' BLOODY KANSAS!!! Pretty much a textbook example of what a great 1950s action-Western should be. Jeff Chandler steals the show as well as Kansas in one of his best ever performances (and he's had so many) as a Quantrill type ransacking Kansas towns, then reappearing with his private "army" to liberate the downtrodden offering protection, promising the Perfect Empire in exchange for support and loyalty. His methods prove to be very popular and our Napoleon of the plains is winning over the territory from the governor and his troops. One BIG mistake. Chandler's Darcy is responsible for the death of Parker's Cam Bleeker's wife while Cam was away in prison. Cam escapes and he wants vengence. Soon re-captured by the governor, he's offered a clean slate if he'll join the Jayhawkers and set Darcy up for capture. This is an important and must have release from Olive Films. It's a beautiful VistaVision print in glorious Technicolor, a sheer joy to watch and behold! Everyone involved is outstanding with an especially nice turn by Henry Silva as a demented psycho gunslinger, you know, just exactly what you would expect from him. ...Saw this on tv in the early 1960s in b&w and liked it alot, so I was expecting to be disappointed, but this time the movie was actually far better than I had remembered it being. I was just a kid back then and so I only remembered the vague outline of what the film was about, as it was a film that somehow always escaped me throughout the years. So while watching this film anew I found myself in for a bonus. For 50 years now I had been haunted by a screen image. That of a little girl running out into the dusty street only to be run over, trampled in the frenzy by the bandits' countless horses. I couldn't remember the movie from which the scene had come from. I asked my Western film friends, but they didn't know. I actually thought that maybe I had imagined it, or that it was from some tv show. Then, it unfolded before my eyes and as it was happening I knew that this was it, the image reappeared, the horses came trampling down upon the little girl. Does she live or die? I won't say. I couldn't remember what her fate was, only the image. Finally, the Jerome Moross score. It's rousing, exciting, befitting of such an action-packed Western. And it's available on Amazon! Buy both the dvd and the cd, I did. One of the minor themes throughout is the WAGON TRAIN theme, subtle at first, then more noticible. This is one of my top purchases over the past year and I can't do better than to urge you to add this keeper to your dvd library. 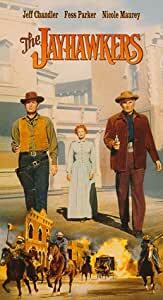 It's certainly one of my favorite Westerns from the 1950s. The item I purchased was the multi-format package - DVD and BluRay - instead I received a BluRay only version. If you want or need DVD then you apparently must buy just DVD - the multi-format option on the website was not what was shipped (at least for me). No complaint about the film itself or the quality of the BluRay disk and package - all were great. Just not what I was promised.